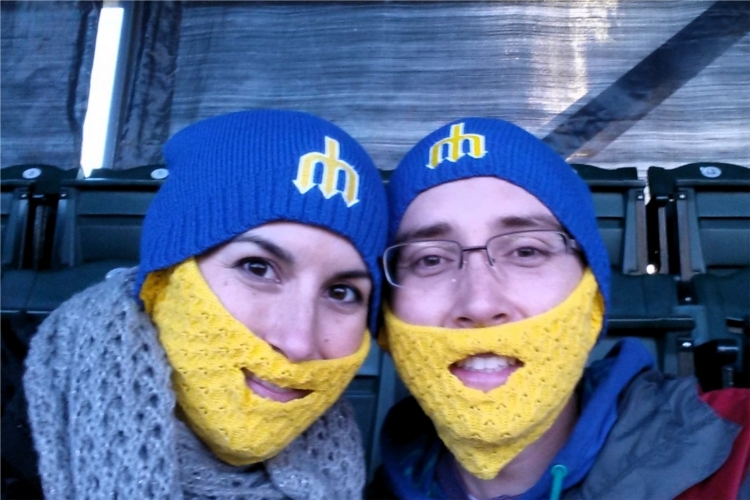 Mariners Game: Beard Hat Night! 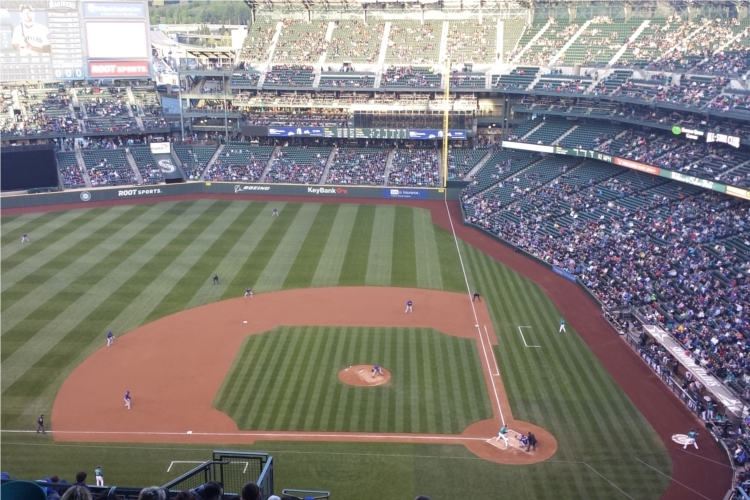 Last night we went down to Safeco Field and caught a Mariners game. It was College Night, which meant we were able to get tickets for only ten bucks (hooray for student IDs without dates on them!). 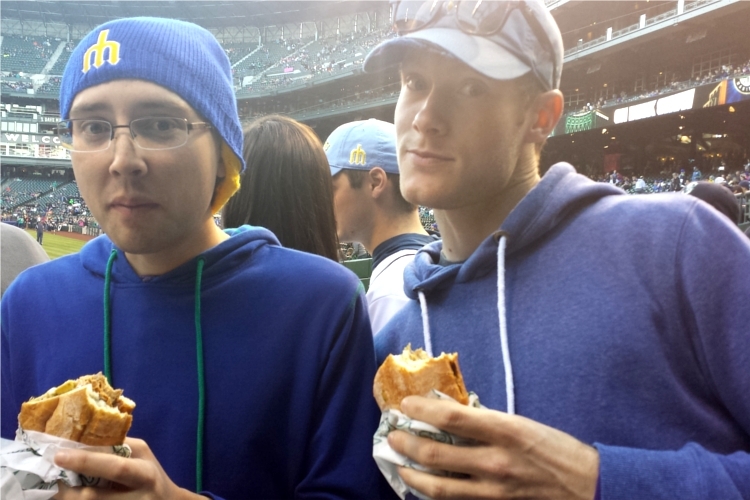 They were also giving away Mariners Beard Hats to the first 20,000 fans, so we were super excited. We went down about two hours before the game started to enjoy the ballpark and the (fleeting) sunshine. College Night meant that beers were “only” $5 until first pitch. 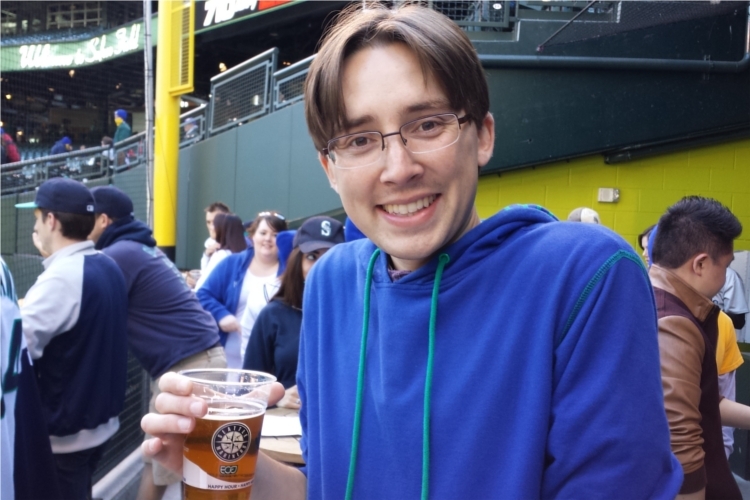 I got Elysian’s Hombre Lager – it was tasty. Before the game started we hung out in Edgar’s Cantina, which is a small restaurant inside the stadium. It’s just beyond the left field fence underneath the manual scoreboard. Edgar’s is a neat place to take in a game because it has such a unique view; you’re very close to the field (only ~8′ above the playing field) and there’s also a window that looks right into the visitor’s bullpen (providing an up-close view of the catcher’s backside). Every once in awhile someone will even hit a home run right into the restaurant. Also, the food is tasty and relatively reasonably priced (especially for a ballpark). Four of us split a huge serving of chips and gucamole (for $4), and the carnitas torta (meat! – #20) I got was on a big ol’ hoagie and had so much avocado and only cost $9. Waaaay better than eating a hot dog and only a couple bucks more. After the first inning, we wandered up to the 300 level and found our seats. We were waaay up there, only three rows down from the top. Fortunately, every seat in Safeco Field has wonderful sight lines, so we still had a lovely view. As the sun set, the clouds behind the stadium were highlighted with a mix of electric pink and deep dark purple, providing a pretty dramatic backdrop for the game. While a bit windy/chilly, it was a nice night for baseball. Seattle was playing the Texas Rangers. The Mariners have been playing terribly so far this season, and Texas was leading the division, so the likelihood of an M’s win wasn’t particularly high. True to form, the Mariners soon found themselves down by two runs, but then they battled back by scoring four runs in the bottom of the eighth to take a three run lead! Their new ($14 million) “closer” came in for what should’ve been an easy outing… and promptly gave up two hits, hit a batter, and walked in two runs. However, despite his best efforts to lose the game, the Mariners first baseman made an extraordinary diving play to snag a hard-hit line drive and execute a game ending double play. Mariners win!! !